Tá an Rialtas i ndiaidh forbairt turasóireachta a sheachaint nuair a bheartaigh siad Slí an Atlantaigh Fhiáin, dar le Tony Birtill. A mhalairt de chur chuige atá le feiceáil sa Bhreatain Bhig agus i Sasana. D’éirigh go maith le Turas Cholm Cille i nGleann Cholm Cille ar 19ú Mí Aibreán (Sathairn Cásca). 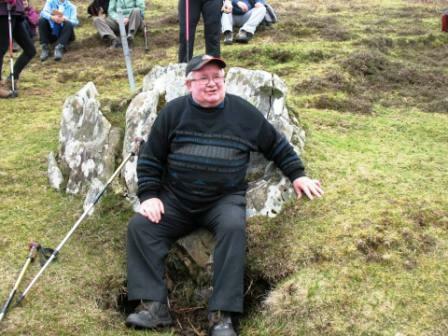 Déantar an turas seo de ghnáth ag meánoíche ar 9ú Meitheamh (Lá Fhéile Cholm Cille) nuair a shiúlann na hoilithrigh thart cúig stad déag atá scaipthe ar fud na Glinne. (Gleann, t. gin., glinne, a deirtear san áit) Seacht gciliméadar ar fad, glacann sé trí huaire go leith an turas a dhéanamh agus go traidisiúnta, bíonn na hoilithrigh costarnocht. Rinneadh an turas Satharn Cásca i mbliana mar chuid den ‘ Lá Náisiúnta Chosáin an Oilithrigh’. Bhunaigh An Chomhairle Oidhreachta an togra ‘Seanturais’ i 1997 chun daoine a spreagadh úsáid a bhaint as slite traidisiúnta mar Thóchar Phádraig, Cosán na Naomh agus Turas Cholm Cille. 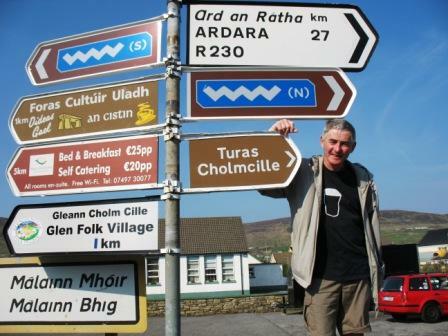 Tá turasóireacht leanúnacha (sustainable tourism) mar seo sláintiúil do dhaoine agus cuidíonn sé le geilleagar na háite. Mar shampla, i 1986, rinne 2,500 oilithreach an Camino De Santiago (Céimniú Naomh Séamas) agus i 2012 192,000 oilithreach. 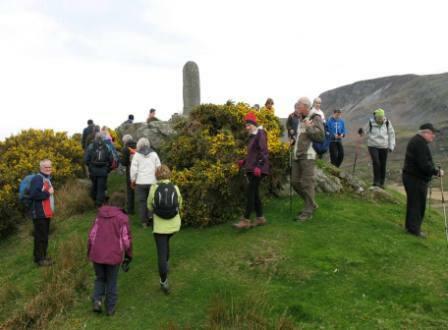 Sa bhliain sin, fuair 4,000 Éireannach Compostella nuair a chríochnaigh siad an Camino. Samhradh na bliana seo chuaigh thart, tháinig An Chomhairle Oidhreachta le chéile le 10 ngrúpa áitiúil agus bheartaigh siad Satharn Cásca a ainmniú mar Lá Náisiúnta Chosáin an Oilithrigh. Rinne 30 duine Turas Cholm Cille, cuairteoirí an chuid is mó acu, ó áiteanna mar An Fhrainc, Sasana, Ard Mhacha agus Baile Átha Cliath. Léigh cuid acu faoin Turas in alt san Irish Times, agus chuala daoine eile faoi ar an Marianne Finucane show ar RTÉ 12/4/14. Dúirt John O Dwyer, Cathaoirleach an tSeanturais, go raibh ciste an-bheag acu- 1,500 euro, airgead a fuair siad ó na 10 dream áitiúil. 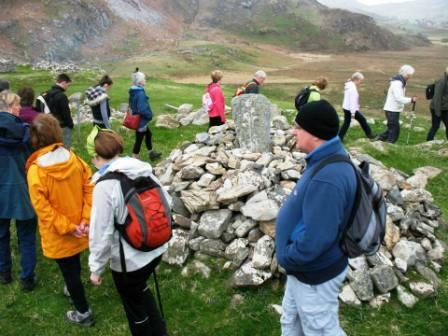 Bhain siad úsáid as sin le suíomh idirlín a fhorbairt, www.pilgrimpath.ie. Le hachmhainní gann mar sin, bhí áthas orm nuair a chonaic mé an scata siúlóirí i nGleann Cholm Cille Sathairn Cásca agus glac 1,500 duine páirt san imeacht in áiteanna eile. Tá codarsnacht mhór idir buiséad agus poiblíocht an togra seo agus turais eile, macasamhail Slí an Atlantaigh Fhiáin, an togra is déanaí ó ‘Fáilte Ireland’. Bhí scéal mór faoi i Travel Ireland Feabhra 2014 (faic faoin tSeanturas) agus fógraí móra i nuachtáin éagsúla. D’oscail an rialtas an tslí, atá 2,500 km ar fad, i mí Márta agus síneann sé ó Inis Eoghain i nDún na nGall go Cionn tSáile i gCorcaigh. Ar bhóithre atá ann cheana féin atá an tSlí agus seo an bóthar chósta is faide ar an domhain, dar leis an rialtas. Mar bharr ar an sparán teann a caitheadh le poiblíocht, tá carn mór airgid caite ar fhógraí gránna, feiceálacha, ar mhuin mhairc a chéile, agus tá siad go forleathan san iarthar anois. Ach i ndeireadh báire, tá an togra bunaithe ar dhaoine ag tiomáint thart le carranna fúthu, coincheap atá go hiomlán as alt san aois turasóireacht inbhuanaithe. Tá feachtas poiblíochta in Éirinn ag Rialtas na Breataine Bige faoi láthair chun daoine a mheallú don tír sin, áit a bhfuil Llwybr Arfordir Cymru ann. Seo an chéad tír ar an domhan le cosán ag dul thart a gcósta iomlán. Osclaíodh é ar 5ú Bealtaine 2012 agus is féidir le daoine siúl ó Chepstow sa deisceart go Queensferry sa tuaisceart. Téann sé thart Ynys Món, fiú, áit a bhfuil Éireannaigh ábalta teacht i dtír ag Holyhead ar an bhád as Baile Átha Cliath. Is é sin, in ionad ag dul siar, chun tiomáint Shlí an Atlantaigh Fhiáin, beidh Éireannaigh ag dul soir le siúl ar an cósta i dtír álainn eile. Meastair gur shiúil 2.8 m duine ar chuid den chósan sa chéad bhliain, le 800,000 cuairteoirí ag fanacht thar oíche i dtithe aíochta agus óstáin ar an tslí. B’fhiú £16m don gheilleagar an turasóireacht seo. Is léir gurb é an togra seo an tslí chun tosaigh sa lá atá inniu ann, agus tá Sasana ag forbairt cosán cósta sa tír sin anois www.naturalengland.org.uk agus beidh an chuid is mó den chosán críochnaithe i 2016. Admhaíonn an rialtas ansin go mbíonn deacrachtaí acu ó thaobh cearta slí de, ach tá siad ag reiteach na bhfadhbanna de réir a chéile. Is í mo thuairim féin go bhfuil cósta na hÉireann, an t-iarthar go mór mór, i bhfad níos áille ná cósta na Breataine Bige nó Sasana ach níl toil ag an rialtas cosán cósta a fhorbairt. Agus tá fáth neamhchas le seo: tá faitíos ar an rialtas roimh na húinéirí talaimh. Sin an fáth nach bhfuil córas cearta slí ar fud na tíre, cósta nó intíre. Mar sin, beidh Éire fágtha in áit na leathphingine ó thaobh turasóireacht leanúnach de, leis an rialtas ag caitheamh airgid ar thograí mar Shlí an Atlantaigh Fhiáin. Buíochas le Dia, tá stuaim agus samhlaíocht ag scaifte nua na Seanturas, bíodh nach bhfuil acu pingneacha.